K2 Roofing is pleased to offer its valued customers the widest selection of applications, products and services available in the roofing industry today. We custom install Certainteed shingles, flat roofing systems, Columbia skylights, external gutters systems and architectural sheet metal to keep your roof looking and performing its absolute best. K2 provides residential roofing, commercial roofing and roof repairs, and new roof construction in Vancouver, and the lower mainland. Our highly skilled, professional team of Vancouver roofers consists of journeymen and other knowledgeable staff providing you with service excellence and superior products that will protect one of your most valuable assets, your home. K2 Roofing also offers free roof estimates and 24-hour emergency service. 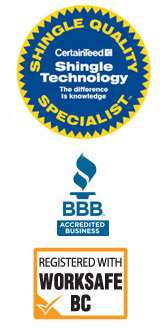 We are one of the top referred roofing companies in Vancouver and have provided quality service at affordable prices since 1992, gaining an A+ Rating with the Better Business Bureau. Roofing systems that are designed specifically to suit the needs of each of our customers. Our work is guaranteed to meet manufacturer’s specifications or better. All labor is guaranteed for 10 years and we adhere to highest standards of best practices. All roofing staff are fully covered by Work Safe BC. We carry $2 million of flood, fire and liability insurance. We are committed to green solutions and have teamed up with Gemaco Recycling in their Roofs-to-Roads program recycling old shingles into re-usable products. When you are in need of roofing services in Vancouver, Coquitlam, or New Westminster, Vancouver Roofers from K2 Roofing is your smart professional choice. See our testimonials page for customer feedback.